BRIAN: People love to see fruit. We often look at those kinds of situations and we think that those happened overnight. The reality is there are no shortcuts to success, and growth doesn't have to be as painful as we often make it. AUSTIN: Well, what's up everybody? This is Austin, one of the partners at Nu welcoming you to the Growth Made Simple podcast, which will educate you, challenge you and inspire you all in under 20 minutes. That's five minutes shorter than the average commute to work, so you'll still have plenty of time to belt out a song or two before you put your car in park. BRIAN: Welcome to the Growth Made Simple podcast, where we believe friction in your organization slows your growth, but simplicity will build your momentum. The Growth Made Simple podcast is for entrepreneurs, business owners and marketing managers alike. If you are passionate about helping your organization grow, then we welcome you to join us on this journey. I am Brian Leimone, your host, and alongside me today is my cohost, Mary Fonvielle. Hey Mary, how are you doing today? MARY: Good, thanks Brian. How are you? BRIAN: Well, we're doing good. This is our first podcast, but before we jump into today's content, we kind of need to acknowledge something pretty spectacular. BRIAN: Today is five days before my son's birthday, and why that's important is because you have to know that I have six kids, and that means that there are eight birthdays that we celebrate every year in our household. Because of that, we put a rule in our family that the [birthday] person cannot talk about their birthday until the previous most recent birthday prior to it has passed, and the birthday prior to this birthday was in the beginning of January. So, since January, this son has been counting down the days. What's interesting is it's not even that big of a year for him; he's going to be 12. So, the next big year is obviously next year. But we're excited today because it is our very first podcast ever on Growth Made Simple. So, before we jump into the content today, we want to talk about the structure, and we want to talk about the value that we're going to bring to our listeners. MARY: Where did the inspiration of this podcast come from? BRIAN: Well, you know, people love to see fruit, whether it's fruit from something you plant, something you watched grow, a promotion at work, or maybe even a sports team winning a championship -- and I definitely need to plug my Duke Blue Devils this year because we're in March Madness as we speak. We often look at those kinds of situations and we think that those happened overnight and that success happened overnight. The reality is, if you've ever tried to grow something, you know it takes a ton of work, often blood, sweat, and tears to get from point A to point B, and there are no shortcuts to success. I really believe that we need to work harder -- well, actually, no, we don't need to work harder. We need to work smarter, not harder, and growth doesn't have to be as painful as we often make it. So, for the inspiration of this podcast, we just want to have a discussion around simplifying the process of growing, or as we've titled the podcast: Growth Made Simple. MARY: What kinds of growth will we be talking about here? BRIAN: That's a good question. As a CEO and the owner of Nu, which is an Inbound agency that helps businesses grow, many of our conversations are going to be around marketing, sales, and servicing your clients. With that said, we know that there are lots of different ways for you to grow your business whether it's through leadership development, defining your core values, vision, or clarifying your message, and all those we kind of believe are rolling up to "simplifying the process of growth". MARY: Absolutely, and I think there're so many facets to growth, and we can cover a lot of that. What should the listener expect? Even though we're going to cover a lot of topics, what can they expect from each episode? BRIAN: We want the podcast to be really jam-packed with valuable and practical information. We're shooting for the podcast to be around 18-20 minutes, which is less than the average commute. 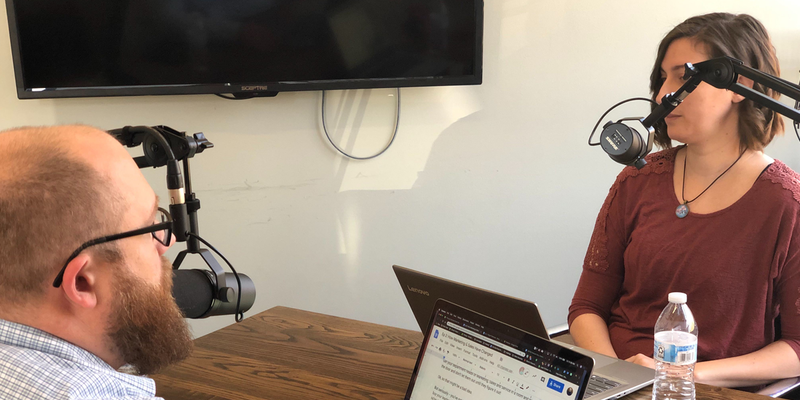 We want it to be hyper-focused on content, so you, as a listener, can feel that when you leave the podcast, you know what steps you can take to simplify growth. We might stray a little from the agenda from time to time, but the plan is to keep the podcast simple. We want to start the podcast off with answering a couple questions from our listeners. As a listener, you can email podcast@nuagency.com and we'll answer them in future episodes. Secondly, the content is going to be value packed, and we want to focus on three to four main points. As we wrap up, we want to provide a quick summary and focus on application. Before the podcast ends, we're going to tease what's happening in the next podcast, and then we're going to give you one action item that you can do now to simplify your growth. MARY: That's great. I love the idea of being able to have, you know, my morning commute where I can listen to some great tips and then come away with something that I can actually implement during my day. So how often are we going to be podcasting and when can we check these episodes out? BRIAN: Right now, the podcast is going to be every other week and dropping on Wednesdays. We feel like Wednesday is a perfect time to talk about growth because it's in the middle of the week, and we could all use a pick me up to get us through the rest of the work week and end strong. So, before we jump into the main content, we're going to take a quick break. BRIAN: Well, welcome back to the Growth Made Simple podcast. My name is Brian and we've got Mary right alongside of us, and you know, we jumped right into the structure of the podcast before we even took the opportunity to talk about ourselves. So, Mary, tell me a little bit about your background and why you're excited to be part of this podcast. MARY: Yeah, so I am the Advertising and Account Strategist at Nu. I work with clients and I work with the Paid Ads department. I have been with Nu for what, two years now? BRIAN: Yeah. It's been, like, two years, is it this month? MARY: No, I think it's in the summer. Before that, I was a freelancer for several years, and before that, I was at college getting my degree in English and creative writing at Appalachian state -- go Mountaineers! I'm excited to be part of this podcast. You know, I don't have a huge background in marketing, but I love learning about it, and I love learning about the different facets that go into helping a business grow. I think there's so much to that. So, I'm really excited to explore a lot of different topics and maybe meet some new people and hear what they have to say. You know, a big part of my job is that I love helping my clients grow their businesses. So I think being able to reach out to people and help them on a wider scale is what I like about this. So, Brian, tell us about yourself. MARY: I had Geo Cities myself. BRIAN: Oh, Geo Cities. Wow. That brings me back in the day, you know? Now, fast forward 20 years and we're an agency that is focused on helping businesses grow through the methodology of Inbound. We have a team of 13 people here locally in Winston. We're about to move downtown, which we're really excited about. As far as being part of this podcast, this is something new, but we know that audio is a great way to get in front of people and help people take their next steps. As Mary has mentioned on our Facebook Lives that we've been doing recently, I think she's mentioned it at least, that we've got two introverts that are here jumping on the podcast. So, it should be interesting. Jumping into the reason why we are here today, today's topic is about buyer personas. So, what is a buyer persona, Mary? MARY: A buyer persona is a profile. It's a fictional character that you actually create for your business surrounding the demographics, the traits, and the characteristics that match your ideal customer or client. It's almost like taking all of your clients or customers, taking their most ideal characteristics, and putting them into one person that you create. BRIAN: So does that mean that we can create a fictional character called Bart Simpson? MARY: I mean, yeah, if you wanted to name it Bart Simpson, go ahead. You're basically taking things like age, income, job title, even where they live, and you're looking at even the little details, like, what are they interested in, what are they worried about or concerned about, what are their goals? You surround those around your business and what you have to offer them, and you're using those personas to sort of understand your audience. BRIAN: Yeah, great. Well, so now that we understand what a buyer persona is and we've given it a name, whether it's Bart Simpson or some random character, how should a buyer persona be used in your business? MARY: So, at one time, buyer personas were...well, they sort of come out of the concept of sales. "Know your audience" is a huge part of sales, and that eventually evolved and sort of took a place in the marketing side of things. Today everybody on your team can and should use your buyer personas. It helps you really understand your target audience in so many ways, and that really helps you whether you're creating a blog post, whether you're designing some sort of campaign, whether you're just strategizing or designing a website. Understanding who's going to be using and who's going to be actually consuming any of that is a great way to make sure that it's tailored to the people that you need to be reaching. BRIAN: So tailoring content is really, really important, but what happens if my business wants to target everyone? Like, you know, is developing a buyer persona going to help me if I'm saying, "hey, I want everyone to consume what I'm serving"? MARY: If you have a product or service that absolutely everyone is going to use, then I don't know what you've been doing, because you've got some sort of miracle product. I think there's definitely value in finding that idea. You know, what is similar or what is the average? What is something that everybody can relate to that's going to help you create more relevant, valuable content? BRIAN: What I hear you saying is kind of that by naming someone, naming an audience, we're able to personalize our content, personalize the marketing, and personalize the messaging that's going to be really impactful for that person that's going to be interested in who we are. MARY: Definitely, especially in today's digital world. You know, personalization is so important when it comes to reaching your customers. It's the companies that you feel you can relate to, the companies that you feel are speaking to you that you're most likely going to go with. BRIAN: On my way in, I was actually listening to a podcast, and Seth Godin was on the podcast. He was talking about the brands or the logos that you are attracted to, and they said that the logo doesn't really mean anything. It's the brand that you have a feeling towards. So being able to understand who your audience is and being able to develop a buyer persona is going to be a great way to get started. We're going to take a quick commercial break, but on the backside, we're going to be talking about two more areas. We're going to talk about developing the buyer personas, and then we're going to end with some good action points about how you can take action in developing your buyer personas. See if your business measures up with Nu's free website grader. BRIAN: We welcome you back to our podcast. We're going to wrap up with just a couple more points. Our topic today has been buyer personas and what that is. So, now we need to talk about how we develop those buyer personas. Mary, can you talk to us a little bit about that? MARY: Yes, and I want to reiterate that this an ongoing process. This isn't, you know, you create it and then it's done forever. This is something that you should be looking at and going back, re-evaluating, and refining on a regular basis, whether that's by quarter, by the year, by the month, or how ever often you need to update those to feel that it's staying relevant to your business. BRIAN: I mean, that's a great point, because as your business grows, maybe your audience is changing. MARY: Absolutely, and you may be discovering new things about your audience that you didn't know before that you can add in that provide new insights on a regular basis. So, you start by looking at the different interests and looking at the demographics, things like age, income, education level. All these things affect people in different ways and all these different people have different wants, different needs. Understanding these allows for a deeper insight into your audience and helps you to address and provide solutions to their specific needs. So, you know, someone that is in a different age group from somebody else is going to have a completely different set of worries, wants, needs, and goals. Collect as much information as you can, whether that's by survey, just looking at people who are following you on Facebook, or whatever, and compile that into a profile. You don't have to create just one. Create as many as you need to fit your customer base. Your ideal audience might be two or three different types of people based on whatever you're selling or whatever you offer. And, like I said, update those regularly. BRIAN: That's great. Those are excellent points. You know, one of the things that we've used is, and you mentioned Facebook, but if you go into the insights of your Facebook page, you can actually see the age demographics of the people that are following you on Facebook. So, if you're not quite sure what type of audience you have, that may be a great place you can start. MARY: Yeah, definitely. If you have a business page on Facebook, then you can go into your audience insights. You can see the average demographics. You can even see what time of day and what day of the week that people are most likely going to be on. All that's going to help you, whether that's just through your social media strategy, that's going to help you when you know you need to be sending out emails. There's so many different ways you can use this content that you're collecting. BRIAN: We didn't plan to talk about this, so I'm going to put you on the spot, Mary. We mentioned different social media tools, and it's not necessarily just knowing your buyer persona and developing that, but every social media has a different kind of audience on that social media. So, would you say that it's important to not only tailor your content and your marketing message to your buyer persona, but also as it relates to the demographics that are being found on the social media platform? MARY: Yeah, absolutely. So, one great thing about buyer personas is it's going to show you not only who's looking at your stuff, but where they are. So, you know, some of your customers might be on Facebook, they might be on Instagram, they might be on LinkedIn, and once you find that out, you'll be able to tailor that message to that platform as well. BRIAN: Awesome. Well, this has been great subject matter today, but we want to end by making sure that you have tangible tools that you can use to jump right in and understand a buyer persona and how to create that. Mary, what are some things that we can point people to? MARY: Yeah, absolutely. So, we've already talked about Facebook. Their audience insights are really invaluable. You can look into Google Analytics, where you can look at things like age, gender, the devices people are using, and where they're coming from. A really, really valuable tool is -- you know, a lot of people don't really know how to get started building these profiles out. They're not really sure if they should be writing it down or making a list somewhere. So HubSpot actually created a buyer persona tool that we're going to talk about and it's great. It's a step by step process. It's almost like a little in-browser game. I was playing around with it earlier today. You could start out with kind of picking a little avatar, and then it will walk you through the process of writing out each of the demographics in each of the categories. Not only that, but each step has a little box on the side that's going to explain why each step is important. BRIAN: Oh, perfect. Is this tool free? MARY: Yeah, this is free to use even if you don't have a HubSpot account or anything. You can just go to this website and you can automatically start creating these personas. If you go to nuexpression.com/persona-creation, you can find that tool. BRIAN: Is it N - E - W expression or is it N - U? MARY: N - U expression.com/persona-creation. BRIAN: Yeah, oftentimes people make that mistake, so good point. So, as we recap, what were the four high level points that we want to make sure you, as a listener, gathered from today's conversation? MARY: Just to recap, buyer personas are a fictional representation of your ideal customer or client. They can be used in every aspect of your marketing, sales strategy, or any aspect of your business to get a better understanding and better insight, and you should be updating them often to reflect your growing business. They reflect real data about your existing customers, whether that's their demographics, their interests, income, education level, et cetera. There's some great tools that you can use to find the info that you need, whether you're looking on social media, Google Analytics, or this HubSpot tool, which will help you create one from scratch. BRIAN: Well, if you're listening to this podcast and you've missed where you can find that buyer persona tool on HubSpot, you can just go to our show notes, and make sure you click on that. That's all for our very first podcast, Mary. It's been great. We jumped right in! On the next podcast, we're going to be looking at how marketing and sales have changed through the years. Well, until next time, remember that friction in your organization slows your growth, but simplicity is going to build momentum. Thanks for listening to Growth Made Simple. We'll be here the first and third Wednesday of every month to bring you the freshest, the smartest, and the "Nu"-est inbound marketing insight on this side of the Mason Dixon line. Now, go find your favorite pump up jams before it's time to get out of the car.